University of Iowa art students (from left) Connor Colvill, Elizabeth Powell, and Drew Etiene have access to sophisticated equipment such as computer numerical control (CNC) machines, which help UI students and faculty bring their visions to reality, experiment on a grand scale, and push the envelope in their disciplines. Students who need the machines for their work must learn how to operate them, and the school incorporates learning those skills into its courses. Photo by Justin Torner. It’s not unusual to find prototyping equipment such as computer numerical control (CNC) machines in colleges of engineering. But it’s much less common to see such technology in a school of art. But students in the University of Iowa’s School of Art and Art History are able to combine traditional artistic methods with computer-aided design software and sophisticated machinery in the CNC and prototyping suite to bring their visions to reality, experiment on a grand scale, and continue to push the envelope in their disciplines. CNC technology utilizes computer programs to control a range of complex machinery. 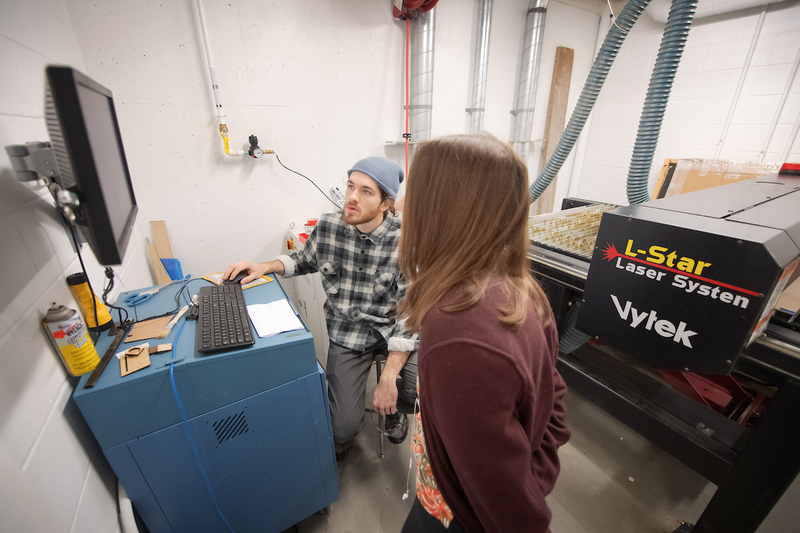 The CNC equipment in the UI Visual Arts Building includes a laser cutter, plasma cutter, mill, and lathe. The School of Art and Art History’s CNC machines aren’t the only ones on campus. However, while students and faculty in other colleges and departments that have similar equipment are allowed to use it once they’re properly trained, those shops also have the option to pay a machinist to complete the job for them. That is not the case in the School of Art and Art History. Students who need the machines for their work must learn how to operate them, and the school incorporates learning those skills into its courses. In fact, 19 courses in fall 2018—ranging from printmaking and robotics to sculpture and ceramics—required the use of the equipment. Faculty and students say gaining these skills is valuable—both for their art and their employability. “I tell students over and over again that when you know how to operate a tool, your ability to conceive possibilities and design things is greatly enhanced,” says Steve McGuire, professor of metal arts and 3-D design and director of the School of Art and Art History. Students in the School of Art and Art History learn how to use the equipment and operate it under the guidance of Instructional Services Specialist Ho Man “Billy” Cho and his student monitors. Cho is in his first year as the school’s first full-time instructional services specialist responsible for the operation and management of the CNC equipment and prototyping facilities. “It’s easy to generate something on the computer, but it’s totally different to know how to actually make it,” says Billy Cho, who is in his first year as the school’s first full-time instructional services specialist responsible for the operation and management of the CNC equipment and prototyping facilities. “When you tell someone in an interview that you have fabrication skills and hands-on experience, they get excited. Most people want to hire someone who knows what they are doing and can actually execute a project. It really adds to a student’s portfolio.” Photo by Justin Torner. Before Cho’s hire, the equipment in the CNC suite was managed by multiple people from areas within Information Technology Services and studio arts. McGuire says the increased access allows the technology to be more easily incorporated into the curriculum. 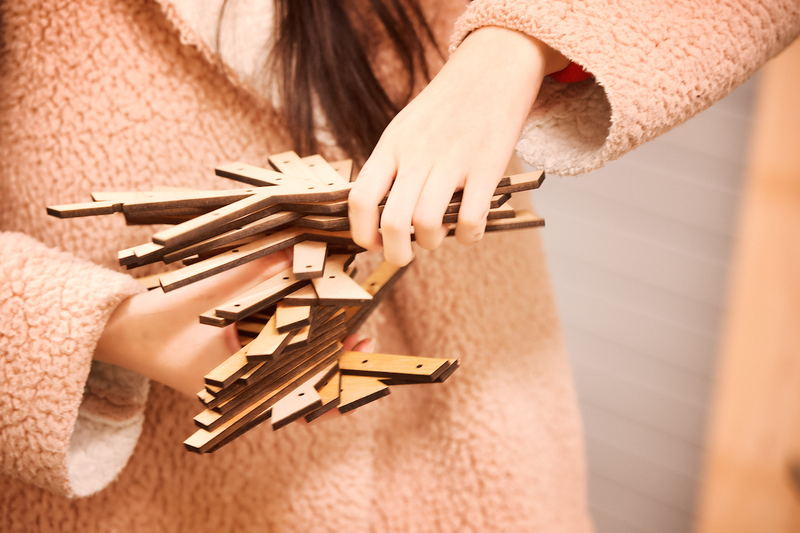 Ni Shen holds wooden pieces created through the use of a CNC machine. Photo by Justin Torner. Much like the students he helps now, Cho had no idea how to use the CNC machines before he began his graduate studies at the UI, where he received an MFA in ceramics in 2016. Along with the CNC machines, Cho also became experienced with tungsten inert gas (TIG) welding through the school’s Fabrication and Design: Hand Built Bicycle classes taught by McGuire. Cho’s job also includes oversight of the equipment for that class. Cho says because UI students learn how to use the equipment in the CNC suite, more opportunities are open to them than to someone with the same degree who lacks similar hands-on experience. Students have real hands-on experience with the equipment. Assistance is available, but the ultimate goal is to give students exposure working with the software and safely operating the machines. Photo by Justin Torner. Students from other areas of campus who take art and art history courses also use the equipment. Colin Flynn, who will graduate in May 2019 with a BSE in mechanical engineering and minor in mathematics, enjoyed woodworking with his father and decided to take an arts course to learn advanced woodworking techniques. Later, as a teaching assistant for a Design for Manufacturing course in the College of Engineering—where he says he was introduced to manual machines such as mills and lathes—he learned about McGuire’s bicycle-building class and petitioned to take it. That’s when he began to learn and experiment with the CNC machines in the Visual Arts Building. Flynn is now one of Cho’s student monitors, helping other students use the equipment. The Oak Park, Illinois, native has accepted a position with a construction company in Illinois after graduation and says the skills he’s gained in the CNC and prototyping suite will be useful. Cho says a unique part of his job is working with students and faculty in all studio arts disciplines. Students in 3-D design or sculpture might use the 3-D printer for rapid prototyping to visualize a work in small-scale before it goes into actual fabrication. 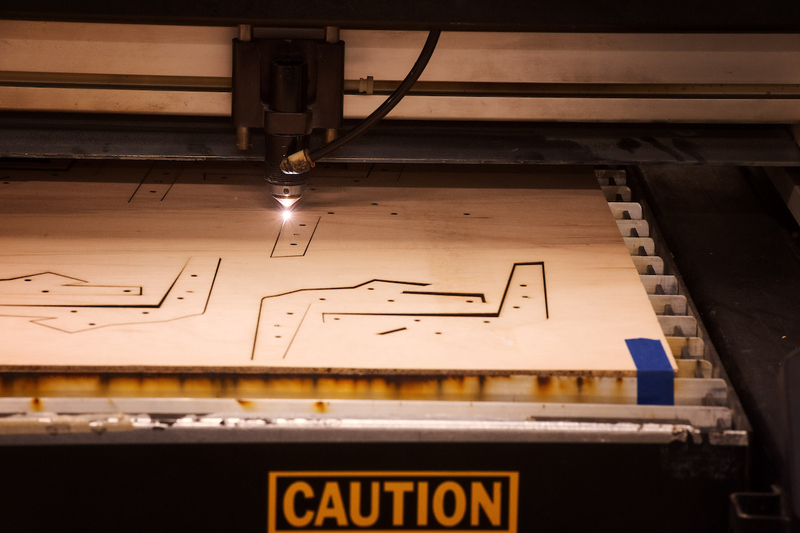 Printmaking students might use the CNC laser cutter to etch on plexiglass or a woodblock. Cho says a particularly memorable project was helping a student use a laser cutter to etch a 4-foot-by-4-foot painting, which took 16 hours. “There are challenges to every project, and sometimes a student or faculty member wants to do something outrageous, but I do my best to help them realize their vision,” Cho says.